Gaius Norbanus Flaccus was a Roman politician and general during the 1st century BC. 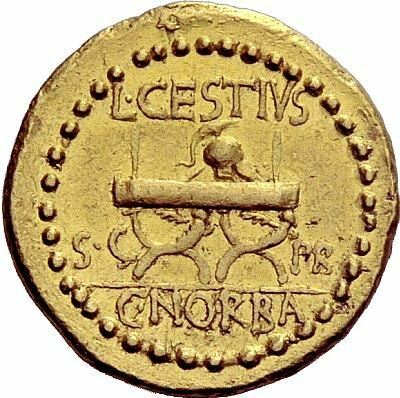 He struck coins jointly with L. Cestius in 43 BC, a year where he also served as Praetor. Flaccus was the grandson of Gaius Norbanus, moneyer for the year 83 BC. His family had suffered under the proscriptions of Lucius Cornelius Sulla, but had found favour under the regime of Julius Caesar. With Caesar's death, his allegiance passed to Octavianus, Caesar's adopted son. With the establishment of the Second Triumvirate and the launching of the civil war against the Liberatores, in 42 BC Norbanus and another general, Decidius Saxa, were sent by Marcus Antonius and Octavianus with eight legions into Macedonia against the assassins of Julius Caesar. Ordered to march quickly to Thrace and hold the mountain passes, thus cutting off the Via Egnatia, Norbanus and Saxa met the combined advancing troops of Gaius Cassius Longinus and Marcus Junius Brutus in the neighborhood of Philippi. They were outnumbered, but managed to fortify the pass until relieved by Octavian and Marcus Antonius. With the victory at Philippi, Norbanus enjoyed the prestige that came with being part of the successful campaign. In reward for his service, in 38 BC Octavianus nominated Norbanus as consul with Appius Claudius Pulcher.